I avidly watched the Oscars last night, wrapped in fleece and quilts with tissues and a cup of tea next to me. As the nominated scenes were shown, I staged my own drama. I didn't dance, nor did I deliver a powerful performance. 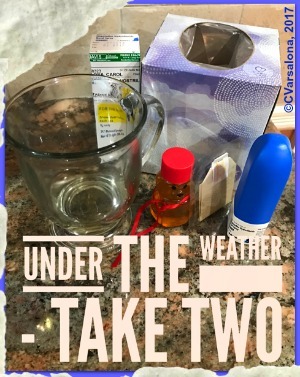 I recounted my private production, Under The Weather-Take Two, based on two earlier episodes, acute sinusitis (that I wrote about here) and rhinitis (here). The drama started the first week in January and has continued. With the weather being so mild and balmy, it is difficult to be inside nursing a series of nagging sinus and allergy problems. I am sure that you recognize my scenario and may have had your own bout with being under the weather. There is a bit of humor to this tale. Today, it is 50 degrees outside and I am inside dressed like it is winter. Oh, wait! It is still winter but Long Island thinks it is spring and this is what may be triggering the infectious nasal conditions. The fact of the matter is that my ENT specialist says his office has been packed with numerous cases of sinusitis, colds, and allergy issues and I'm under the weather for the second time. While my Under The Weather-Take Two drama, may not be award quality material, it is real. 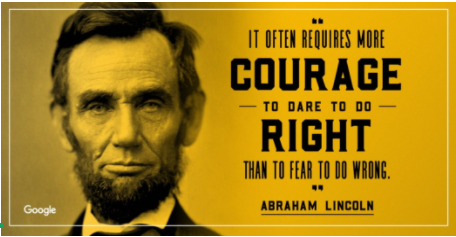 Here's to another week of following some wise advice. I shall drink plenty of fluids, rest, add my allergy pill to my daily regimen, and use a newly prescribed nasal antihistamine to get back on my feet. Let's hope all of this works so I can be on top of the weather instead of under. 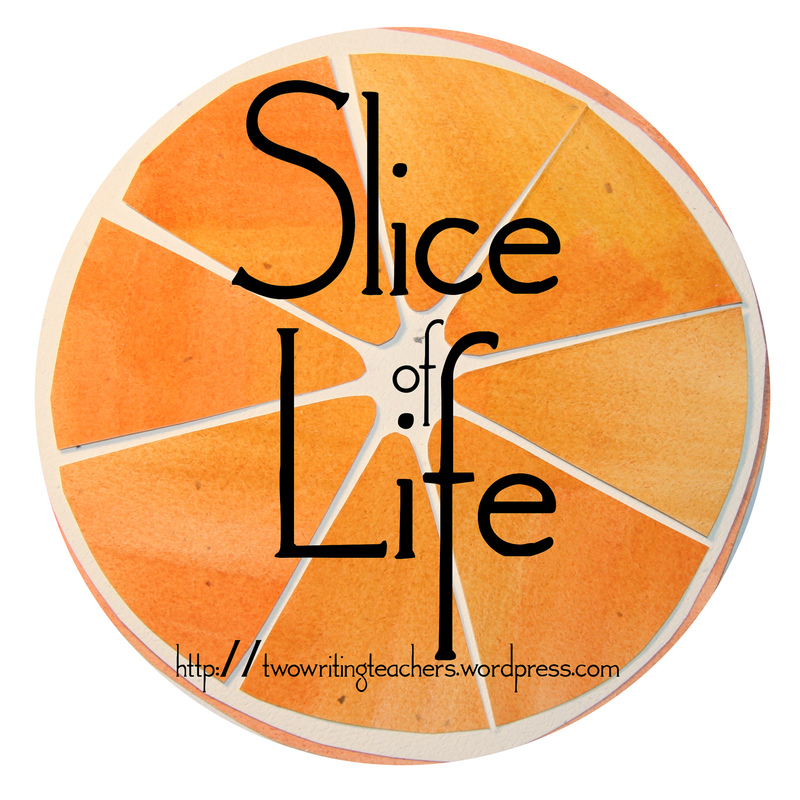 I'm slicing today with Two Writing Teachers. You can join in here! If you are interested in contributing to my #WinterWonder17 Gallery, please submit your offering as soon as possible. Inside active, student-engaged classroom communities, processes of noticing and wondering, are found leading to the development of unique thoughts and authentic voice. Teachers, as thoughtful guides, lead students forward on journeys of the mind where paths of inquiry are fostered. Choices are provided. Critical thinking and accountable talk occur leading to the amplification of student voice. Both DigiLitSunday led by Margaret Simon and #10FoundWords Project (Day 25) created by Laura Shovan invited writers to synthesize their thoughts on prompts provided. 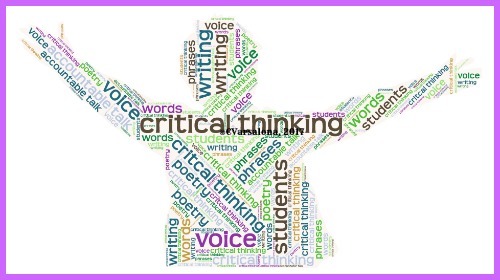 I created one poem based on Margaret's topic, Critical Thinking, and Laura's 10 found phrases from “Teaching Resistance in Unjust Times,” by NCTE Historian Jonna Perillo, NCTE Blog, 2/15/17. are their tools of resistance. It's amazing to me that it's February and Mother Nature is sending out spring vibrations. Birds are chirping their morning tunes, making wake-up a pleasant surprise. By mid-afternoon, my neighborhood is alive with children dressed in shorts and t-shirts. I listen to the swoosh of basketballs, and watch the parade of bicycles rolling on by. Mothers stroll with their baby carriages as they enjoy their walk on a warm winter day and I feel the beat of life as I walk the streets. Neighbors stop to converse. Weather seems to be the topic of conversation. What a sharp contrast this week is to the two weeks before when the snowstorm dropped mounds of white fluff for the neighborhood to clean up. At that time, I celebrated winter snow. Now I see only a couple of mounds left and I can celebrate winter warmth that flows over our neighborhood like a sweetness. While celebrating winter warmth, nothing is more inspiring than seeing a brilliant sunset to close a winter day with a spring-like feel to it. 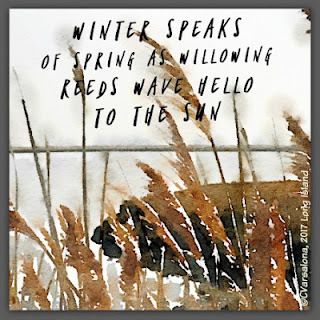 It is time to celebrate this week of warm temperatures, poetry writing, and the breath of spring upon our winter days. Ruth Ayres opens her writing space each weekend for the #celebratelu community at her blog. You can access Ruth's thoughts and those of the community that I am a member of here. 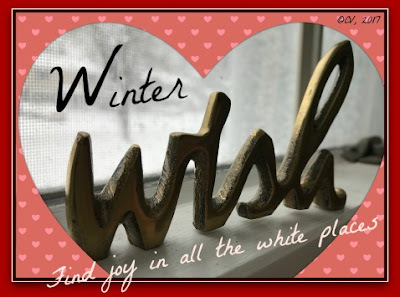 Note: I am reminding all who read this post that the deadline is upon us to offer digitals to celebrate winter at my newest gallery, Winter Wonder. Consider sending me a photograph, image poem, or inspirational quote for the gallery, understanding that winter can be signified by warmth or bitter cold and snow in your locale. There is a story in every season and digitals can be the medium to express your thoughts. There are those thankful moments in life when you stop and reflect on the power of friendship. Writing is one way to keep in touch with friends but over the years the art of writing letters and postcards got lost in the shuffle of tweets, messaging, and text messages. Recently, notecard and postcard writing, a past practice of the 20th century world, is being revived as a non-digital way of communicating with poetry friends. Lately, I have been receiving written poetry gifts from friends through the mail. This is a delightful way to be on the receiving end of kindness. After celebrating acts of kindness over the past weeks, I sit back to recall the poetry gifts I received that provided moments of joy. Michelle H. Barnes sent me a copy of Sylvia Vardell and Janet Wong's marvelous new Poetry Friday Power Book, Here We Go, with a personal note. Michelle said that I won the book and this pleased me so much because I have been eager to read Here We Go. I have read many reviews on it by other Poetry Friday friends, have been happily reading each of the power packs in the book, and tweeted out my excitement for receiving the book. My quick thought is: Educators, this book is a Must Have for your classrooms and a fun resource to encourage students to write poetry. Beside that wonderful gift and card, other Poetry Friday friends sent me poetry postcards from Jone MacCulloch's New Year #PostcardXchange. 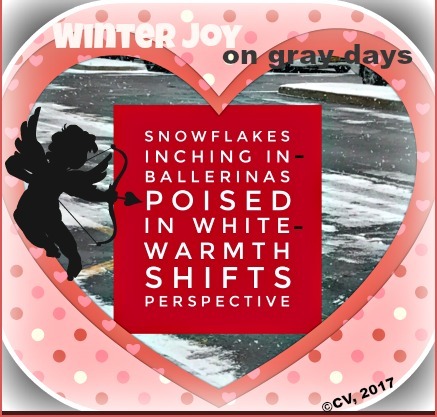 Thanks to Linda Baie, Brenda Davis Harsham, Jone MacCulloch, Bridget Magee, Diane Mayr, and Donna Smith for their beautifully-created digital postcards and notes that brightened each day that I received one. The last treat arrived a few days ago from my poet friend, Laura Purdie Salas. 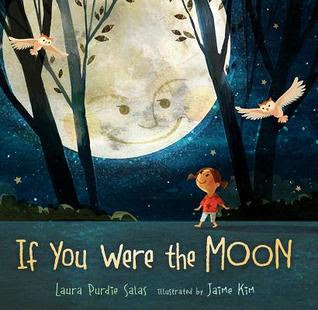 She has written an imaginative children's book, If You Were the Moon. Keri Lewis's review was the first one I read and I was immediately intrigued. My response to Keri was "Keri, your review of Laura’s book makes science come alive with a poetic touch". You can quickly become immersed in this captivating book that lets you see the moon through the lens of science. Check out the book trailer below. Then, let the book have a prominent spot in your children's bedtime library or in your classroom's library corner. While I believe what Carl Sandburg said about poetry, "Poetry is a packsack of invisible keepsakes", I have a visible place of honor for all of the poetry gifts I have received. Lasting memories will be stored in my heart. Please join me for the Poetry Friday Round-up at Karen Edmisten's site. to break out and be outside enjoying the wonders of nature? On Sunday, with the desire to smell the fresh air, my husband and I went for a walk in one of our favorite parks. 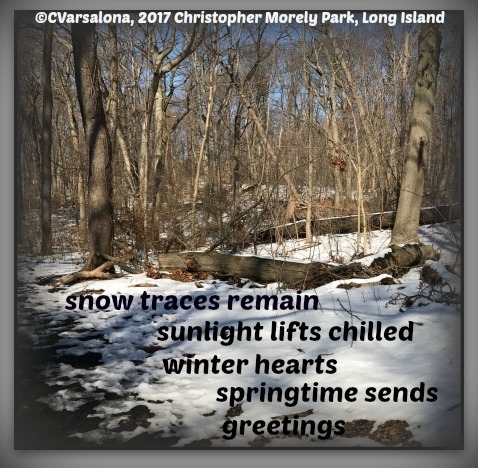 There were traces of snow still on the ground reminding us of the recent storm but the sun was casting a warm glow and sounds of laughter were coming from the entrance of the park. Not only were the humans out for a walk, but so were the dogs, frolicking in the dog run area. My husband and I watched with interest and then, passed on by. Our nature walk was awaiting us. We walked carefully around a closed gate wondering why it was locked. As we followed the curved incline, I felt the warmth of the sun peeking through the trees, many of which were laying horizontally on the ground. Two from different sides of the clearing were touching each other, as if they were joined together. There was much to notice and wonder about. We were deep into the maze of curved paths when I found a stump topped with snow that would be a perfect container to cradle some loose needles. There was a stillness on the trail. No voices were heard but ours. In the silence, spring waited to speak. When we came back to the main path, the dog run park was filled with more friendly animals. All the dogs and their owners were enjoying the beautiful weather. Any new dog approaching the dog run, was immediately approached by a group of barking dogs, clustering around. I wondered if a relationship was going to be started or just a quick acquaintance made?" I paused to think about the different types of relationships most people have: family, work, or school relationships. From these multiple relationships, communities grow. My thoughts led to additional wondering. What if all communities foster a culture of trust honoring all voices and welcoming newcomers? What if all classrooms have welcoming environments? What if all children communicate freely and respectfully with each other? What if people notice more of the beauty that exists in the world and wonder more about the positives of life? With a few more what ifs inside my head, we headed home acknowledging that the afternoon was well spent. 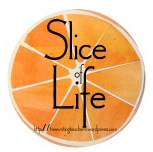 Tuesday is the day set aside each week for Two Writing Teachers to open their doors to the Slice of Life commentaries. You can read what others have captured in their writing this week by linking here. If you are writing alongside me for my #WinterWonder17 Gallery, please submit your offering by the end of February. There are many types of relationships in life, once fostered, that bring joy to life. Last week, during Random Acts of Kindness Week, many people willingly gave of themselves to bring a slice of happiness to others. Relationships were developed or broadened and those who gave also received benefits. Building relationships with others is a gift that leads to a healthy lifestyle at home, work, and in school. 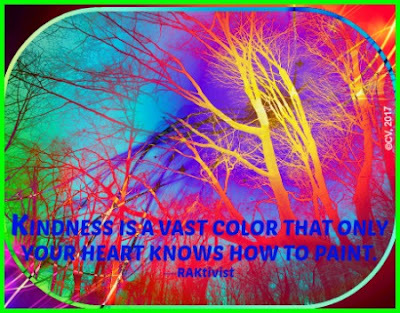 The Random Acts of Kindness Foundation offers research on the benefits of kindness to one's health. Studies show that continual acts of kindness reduce stress, pain, health, anxiety, depression, and blood pressure. It is no wonder that acts of kindness are publicized. Imagine this: if all parents and teachers offered guidance on how to give from the heart then, acts of kindness could become the norm, not the exception. Finding the time to offer and celebrate kindness is not difficult. A smile, statement of praise, and a positive attitude are the first step. 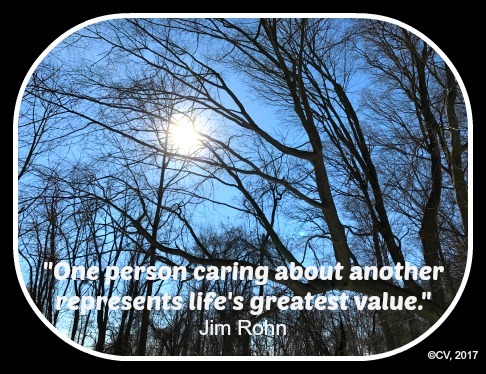 It is a wonderful feeling to give to others and it improves one's health so developing relationships should be a priority beyond Random Acts of Kindness Week. Margaret Simon opened DigiLit Sunday yesterday with the theme "Relationships" and provided a look into a student-led act of kindness project that is one the news feeds should pick up on. You can read about this here. This week I have celebrating kindness during Random Acts of Kindness Week. 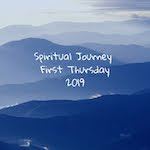 While I believe that kindness should be a normal occurrence throughout the year, it is wonderful to have one week and a special day set aside to celebrate different ways to reach out to others. Send inspirational messages, either digitally or non-digitally to add some sparkle and warmth to others' lives. =>My first step in celebrating kindness this week was to dip into my stock of digital inspirations and send one out on social media. 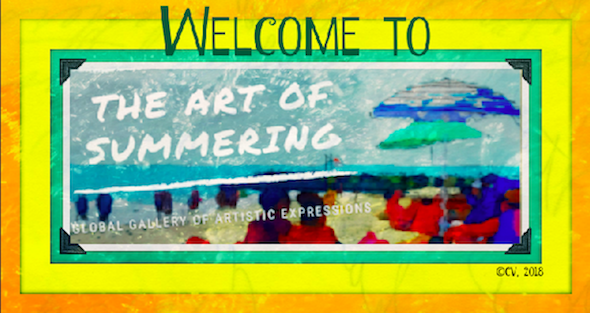 Share your writing with social media friends to celebrate the art of writing. 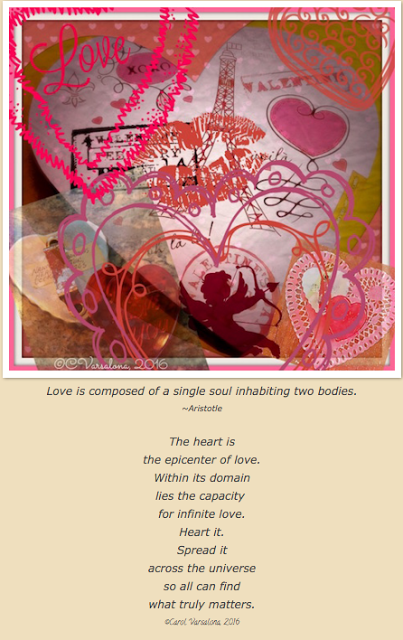 =>The digital inspiration below accompanied my recent post, Heartfelt Creations. 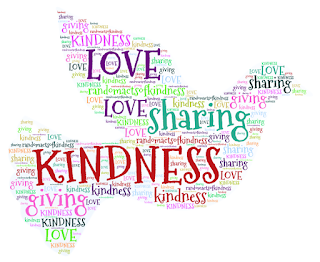 Spread kindness throughout Twitter with kindness tweets. =>I sent a kindness dove around the globe that I created to key connected educators and asked them to spread the message. They agreed and the dove circulated bringing messages of kindness. Share blog posts on kindness with members of your PLNs (professional learning networks. 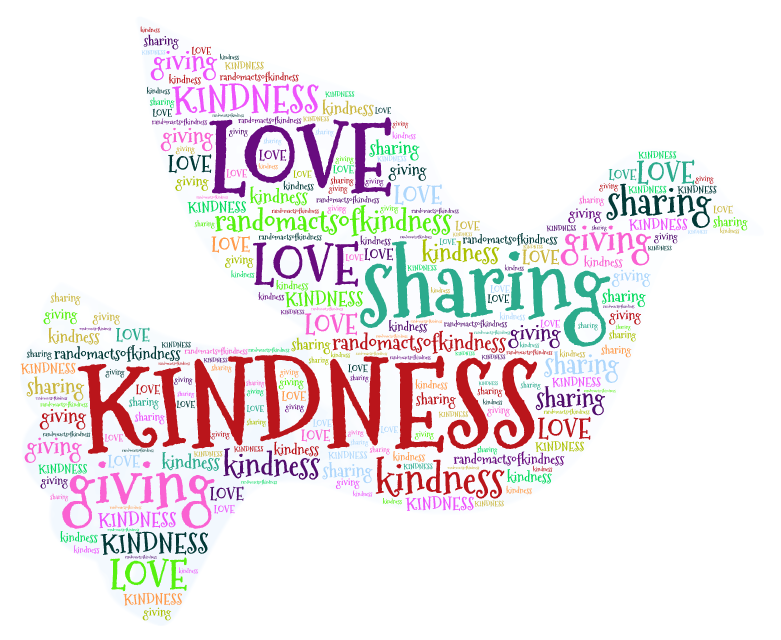 =>I created a post for the Wonderopolis Wonder Ground, Kindness In 5 Words. It featured a poem, How To Love Your Little Corner of the World, in English and Spanish by Eileen Spinelli from The Poetry Friday Anthology of Celebrations, compiled by Sylvia Vargas and Janet Wong as core texts in a lesson on kindness. Bake for family and friends because baked goods are a great way to bring happiness to others. =>Ruth Ayres reminded me through her picture of a cake to add this thought to my blog post. Tonight, I baked my coconut almond cookies dipped in chocolate for a celebration of friends. Promote kindness through smiles, a random act, or listening intently to another. It is easy to give of yourself if you practice the art of giving and being hospitable. This is important so that we can model for our students, children, family members, and all those we come in contact with. Tonight, my yoga teacher reminded us that we need to let go when involved in yoga meditation. This is an important act of self-love that contributes to our well-being. Kindness can go a long way in promoting peace and understanding. When days are gray, like they have been on Long Island lately, keep finding the joy in life. Continue to spread kindness through notes, tweets, and random acts. 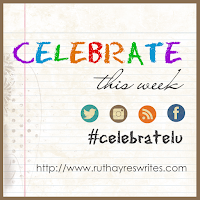 Ruth Ayres opens her space each weekend to Celebrate This Week with fellow bloggers. I am joining her to add my thoughts. You may be interested in joining in the conversation. 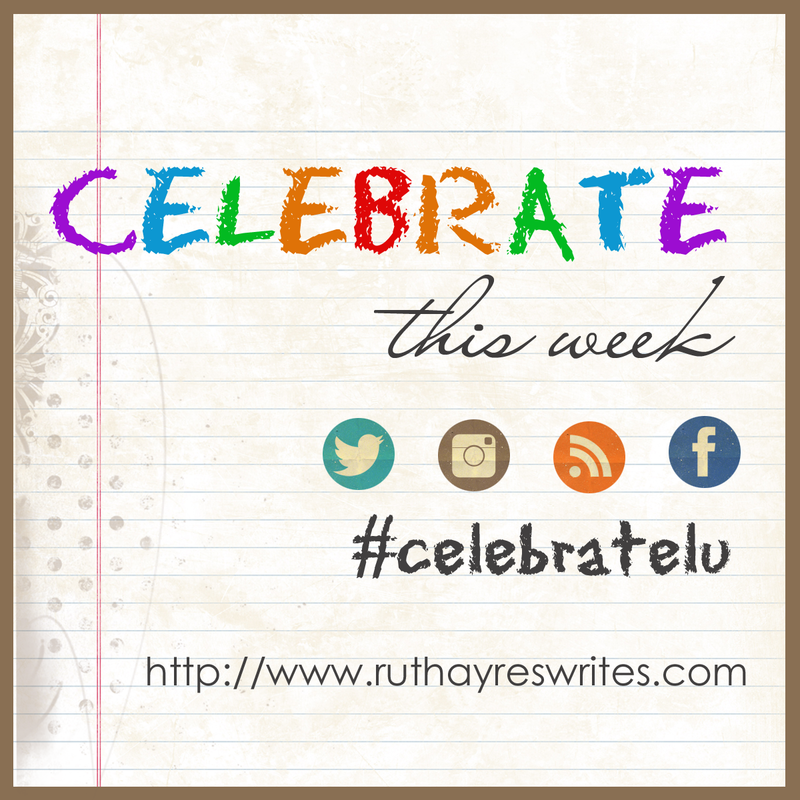 You can access the site here and at #celebratelu. Poetry draws us into an experience. It can softly unfold sensory experiences, carefully present the underpinnings of the heart, and provoke thought on the part of the reader. It moves words to center stage as the writer mines and crafts them into individual creations ready for public comment. As J. Patrick Lewis, children's book writer, poet, and third U.S. Children's Poet Laureate (2011 to 2013) says, "poetry seized me by the nape of the neck and wouldn't let go." Poetry has that kind of a pull. It is the magical musings of the writer that surface into an heartfelt creation. 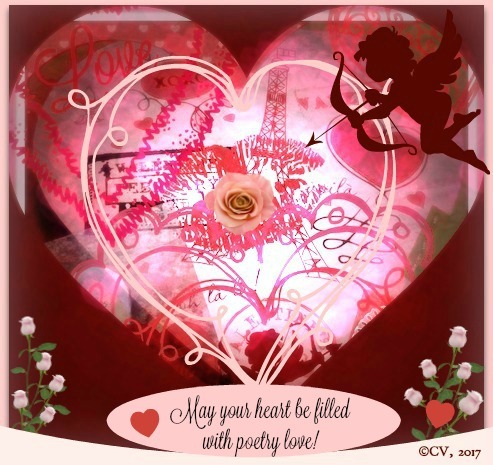 This month, I was drawn to write daily drafts of poems alongside others in author and poet, Laura Shovan's 5th Annual February Daily Poem Project. This project appears on Facebook and also on Twitter, under the hashtag, #10FoundWords. 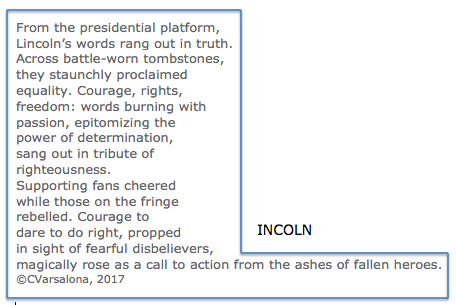 Based on 10 words found in the Washington Post article on J.K. Rowlings' Twitter feud with Trump supporters, the following evolved. experiences that fire up romance. Spend time noticing and wondering. Explore the small moments in life. of negativity that are floating around. Seek the positives that nature offers. Cupid fires up his darts, ready to play. Disguised as a postman, he lifts his pack. Sending sweetness to those who give their consent. his chase continues as he expends love. And shoots off his arrow with quiet dings. Spend time with your loved ones for true love lasts. Poetry calls me to write. What draws you to write from the heart? Poetry Friday provides the space for writers to express themselves in a variety of ways. 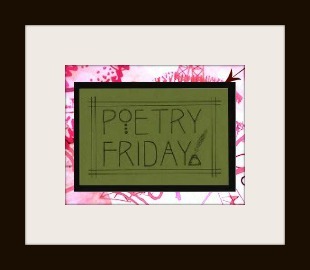 Visit today's Poetry Friday host, Jone MacCulloch, to engage in heartfelt writing. A heartfelt congratulations goes out to Laura Shovan for winning the 2016 CYBILS Poetry Award for The Last Fifth Grade of Emerson Elementary. Amazed by the warmth of winter, my husband and I decided to explore the quiet beauty of the nature preserve last week. 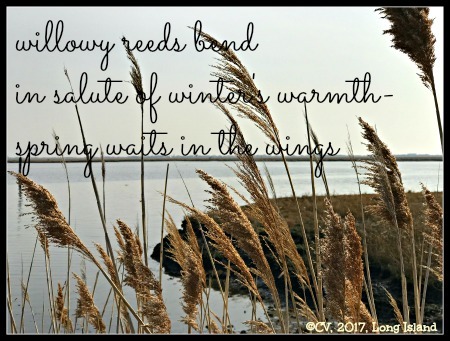 Our goal was to take in the serenity of the marshland and feel the peace of winter warmth before the expected snowstorm's arrival. Soon after we parked the car in the nature preserve's lot, a damp stench was detected. It rose from the ground surrounding the walking trail. As we walked onto the pathway, I noted that murky water lay under the vegetation. This was my cue to walk cautiously down the platform, raised above the ground. My husband obliged my wishes and walked single file behind me. I could not help but think what would happen to me if I slipped and fell into the muddy, smelly waters. Would I look like a mud creature and smell like a swamp? With this thought in mind, I carefully watched my footing as I maneuvered from one walkway to another. As the ground leveled off, we came upon a beautiful sight. I scanned the area, noticing tall reeds swaying in the breeze. The scene in front of me was picturesque. 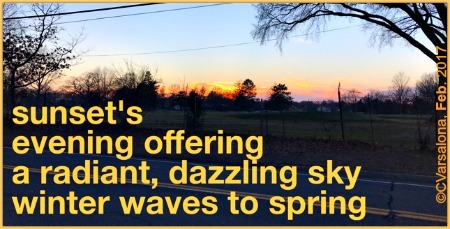 I readied my iPhone camera to capture the essence of warmth on a spring-like winter day, took several shots, and paused. As we continued to look out from the clearing, my husband pointed out the Jones Beach theatre that sits majestically in the distance. I quietly imagined summer concerts, loudly ringing out favorite tunes. A story of peace was evolving. A stillness enveloped the preserve. As we turned into another path, a sole duck lazily glided in the water. He was not bothered by us, the onlookers. He was more interested in soaking in the sun's rays, just as we were. Beautiful, sparkling reflections were edging toward the duck. 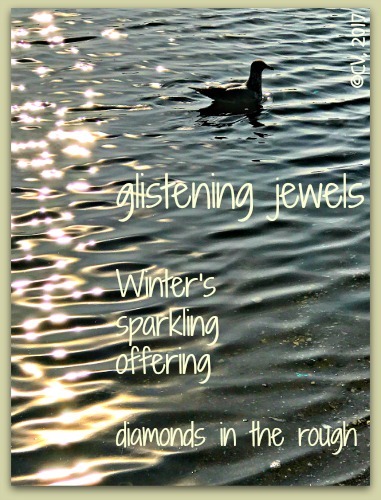 A vibrancy was noted as ripples of water moved closer toward the flickering diamond shapes. The feel of spring was in the air and the duck seemed to sense it. 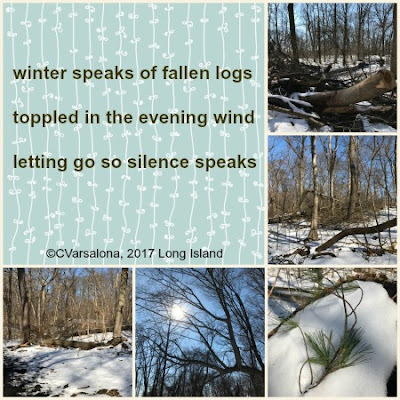 Winter warmth, an unusual occurrence in February, settled in, and for the time being we were aware of nature's quiet presence. In this following image of the scene above, I used apps to create a soft ambiance for my image poem. It was tranquil during the hour we walked around the preserve. There were no distractions. While the duck would continue to glide, we knew the world was calling us back. We left with the intent to return on another day. 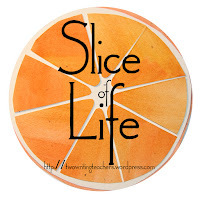 This slice of life is being offered to Two Writing Teachers who open their site each week to a community of educators writing about the small moments that comprise their lives. This slice became a joyful act of remembering a time when life stood still. Today, as we move through the 21st century, connectivity has increased, opening many channels that were not available before. Now, adults and students can communicate quickly and effectively through social media, expanding our reach to those around the globe. Global collaboration easily occurs through virtual platforms, as evidenced in the image below. In addition, digital communities meet regularly and share ideas through tweets and blogs empowering educators and students to expand their own learning paths. 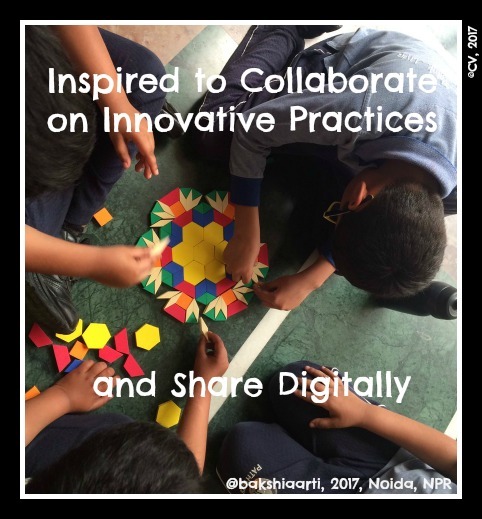 The digital world has opened doors to innovative practice, inspiring inquiries, and engaged learning. It is in this digital world that ideas move from thought to actions and swell beyond local areas to regions and into global movements. On February 20, 2017, #NYEDChat will air at 8 pm EST to celebrate digital learning in preparation for Digital Learning Day 2017 on February 23rd. An invitation to all state chat moderators, parents, and students has been sent out via Twitter and Facebook. Everyone is welcomed to join #NYEDChat, the voice of New York State educators, to celebrate innovative ways that ignite active learning. The Digital Learning Day site defines it as "any practice that effectively uses technology to strengthen a student's learning experience." Across the world, education chat leaders and participants explore digital learning as an integrated component of a student's day-an engaging practice that blends technology with content areas. In one-to-one environments, students can easily explore inquiries of choice, create projects based on information gathered, and amplify their voices through digital means. Beyond the school day, adults are provided opportunities to connect with other individuals in asynchronous, high-powered conversations, and professional learning opportunities that would not be accessible without digital means. Why was Digital Learning Day started? The Digital Learning site states that #DLDay started as a way to actively spread innovative practices and ensures that all youth have access to high-quality digital learning opportunities no matter where they live." The short video below from Digital Learning Day 2015 provides a glimpse into the event. On Twitter, educational chats discuss relevant and timely topics. 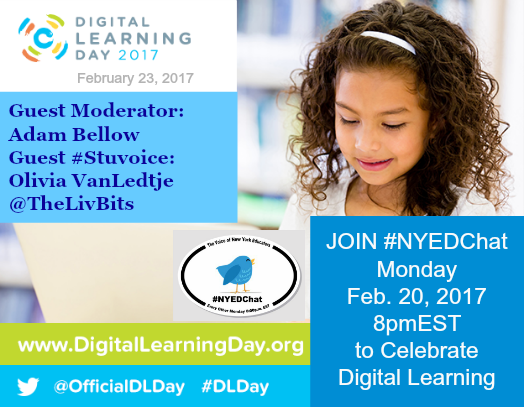 Join #NYEDChat on February 20th to examine innovative, collaborative, and inspiring digital practices that allow students to become content creators and owners of their learning. Let's bring education leaders, teachers, parents, and students together to celebrate #DLDay with the understanding that it is "not about technology; it's about the learning." Tonight, I link with the #DigiLitSunday community of writers under the leadership of Margaret Simon to explore digital learning.